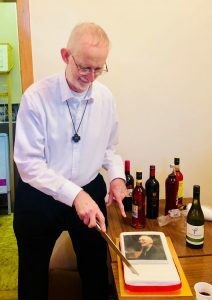 The opening Mass for a new session of the St. Mungo Singers is always a joyful event but this year’s, on 19th August, was a special one as we also celebrated the 60th Jubilee of Brother Julian Harrison’s Profession as a Marist Brother. It was a great excuse for a party, not that the Mungo Singers ever need an excuse. Br. Julian has been a member of the St. Mungo Singers for many years, firstly in the tenor section and latterly in the bass section. He also sings in a barbershop quartet! 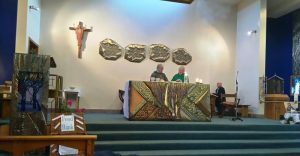 To balance the singing, he taught for many years in Dumfries, Glasgow, England and Cameroon He also walked the Camino to Compostella. Fr. Gerry welcomed everyone back to sing our way through a new year. A special welcome was extended to Sr. Pauline from Barbados who was home for a visit. The second reading for the Sunday was very appropriate, as St Paul invited us to “sing the words and tunes of the psalms and hymns when you are together, and go on singing and chanting to the Lord in your hearts…” and the choir did so with great joy. We also remembered in prayer those of the choir who were unable to be present through illness. After the Mass, everyone went through to the parish hall where a lovely buffet spread had been set out, as well as a beautiful cake for Br. Julian to cut. 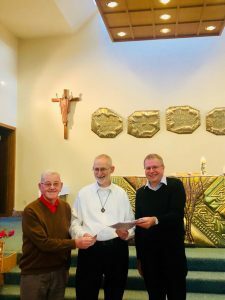 His fellow Marists were not forgotten as a large piece of the cake was reserved for him to take home to them. Ad multos annos to Br. Julian and to the St. Mungo Singers! And a very warm welcome to the 3 new choir members. Dream of Gerontius Concert – 13th October 7.30 Bute Hall, University Avenue, Glasgow.